The ‘Final Theory’ the title refers to is the search for an overarching theory that could incorporate both the standard model of particle physics and General Relativity. A theory of everything has philosophic implications for a comprehensive metaphysical system that could create a coherent and complete world view. Cassidy’s book is therefore a quest of great ambition, to render into poetry the workings of the Universe, although the notes describe this as an attempt that ‘arrives somewhere less certain’. Final Theory is a long poem in four numbered sections that ranges over New Zealand, Australia and Antarctica -- the component parts of the ancient super-continent of Gondwana. At times it is difficult to know the scale as, at one moment, we are shown a distant time of replacement suns and a redundant moon and, at the next, travellers in the now separated continents that were Gondwana, now in the Anthropocene. (eating images, not colliding). And rests. In terms of her role within the narrative “The child is an erratic.” (Final Theory, II, p25). She is an elemental, an innocent ‘fool’, able to speak truth to power whose vision, lent to us is at a smaller more haptic scale exploring with the senses within the body’s range. and shed itself. The taste and quiver. Clouds and islands enter, exit. If there’s land it bubbles. Its subtle lip, its slumping bowl. Water furies the pores. Ah lahar. The poet here uses a wide vocabulary with precision that sits easily within the line to give layers of meaning. I loved the word slump for its impression of shape and its image of molten glass but also how it gives a viscous molten sound so that all parts of the poem are working together. Water vapourising does move furiously - a perfect image in just four words. I had to look up the word lahar (a destructive mud-flow on the slopes of a volcano) but even not knowing its meaning in my first reading I loved the sound of it, given emphasis by the use of ‘Ah’. The poem is well-crafted, there is no feeling of ‘cleverness’ in the use of unfamiliar words but of rightness. The known is also refashioned and repurposed: an image of dead birds lying ‘claw to ceiling’ (Final Theory, I, p16) deliberately evokes that familiar figure of speech ‘floor to ceiling’ employing its comforting sound and rhythm but adding to it. Diving appears in both Certain Fathoms and Final Theory and maybe it is the ability to explore an environment that few enter and is so alien to our terra-centric lives that provides some of the impetus for her poetry. Final Theory reaches somewhere more uncertain and we should be grateful for that as this reflects the ‘uncertainty’ (Schrodinger) of locating precise meaning through poetry. It is the ambiguities, particularly of poetry, that provide alternative readings and remind us of the nuanced multiplicity that exists. Bonny Cassidy does multiplicity in precise and richly textured language that is a pleasure to read and whose images hold in the mind after the words have dissolved into silence. Once, during a Roy Andersson film I saw celluloid burn that way. burst the scene and grew. 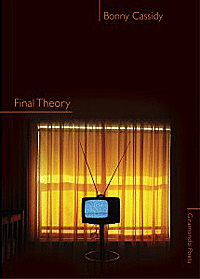 There are some shared concerns with her first book, Certain Fathoms from Puncher and Wattman published in 2012, but this new book, Final Theory is more developed and interrogates deeper. It will be interesting to see where Cassidy goes next, to a further development of the themes of time and biological life or somewhere radically different. into a ranging sheet of light.